1: Hold a VMware Certified Professional 6 (VCP6) or later version, for any solution track (e.g., VCP6.5-DCV, VCP6-NV, VCP7-CMA). 2: Recommend completing the latest Hands-On Lab(s) for vSAN. 3: Recommend attending VMware vSAN: Deploy and Manage [V6.6] course. Note: This training is strongly recommended, though not required. 4: Review the VMware vSAN 2017 Specialist Exam (2VB-601) Exam Prep Guide knowledge and objectives. 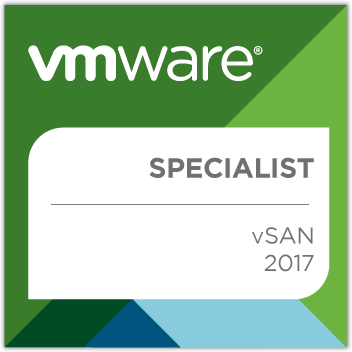 5: Pass the VMware vSAN 2017 Specialist Exam (2VB-601).